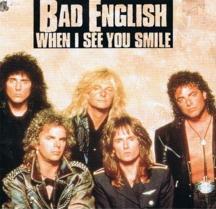 "When I See You Smile"
"Heaven Is a 4 Letter Word"
"Best of What I Got"
(1989) "When I See You Smile"
"When I See You Smile" is a song written by Diane Warren and performed by American/British band Bad English. It was released in September 1989 as the second single taken from their self-titled debut album of the same name, released in 1989. The power ballad became the band's only U.S. number one hit when it peaked there in the fall of 1989 for two weeks. In the video the band are performing on a stage, which contains close-up shots of its members. The footage was taken at one of their arena concerts. It shows Jonathan Cain's distinctive synthesizer opening and moves into the soft initial vocal work of John Waite. The tempo picks up with Deen Castronovo's drum work and Neal Schon's trademark guitar during which Waite becomes more emphatic vocally; the song finishes with Waite's soft vocals. The video was directed by Jonathan Cain. ^ "The 10 worst power ballads ever written". Louder. ^ "Bad English - Chart history". Billboard. Retrieved 2014-02-26. ^ "Australian-charts.com – Bad English – When I See You Smile". ARIA Top 50 Singles. ^ "Top RPM Singles: Issue 6623." RPM. Library and Archives Canada. Retrieved April 5, 2019. ^ "Top RPM Adult Contemporary: Issue 6656." RPM. Library and Archives Canada. Retrieved April 5, 2019. ^ "Notowanie nr414" (in Polish). LP3. January 27, 1990. Retrieved April 5, 2019. ^ "Bad English Chart History (Hot 100)". Billboard. ^ "Top 100 Singles of '89". RPM. Library and Archives Canada. Retrieved April 5, 2019. ^ "Billboard Top 100 - 1989". Billboardtop100of.com. Retrieved April 10, 2019.